Trust Custom Electrical Solutions for retrofitting of fixtures in your home or office. If your lighting is dated and you want to upgrade without the cost of making full replacements of your fixtures, Custom Electrical Solutions has the answer you seek. We specialize in retrofitting of fixtures and provide services throughout the Tri-County area. All residential and commercial clients are welcome and no job is too big or too small. Retrofitting of fixtures is an excellent way to save money while updating the look of your lighting. New lighting options are designed to work with your existing fixtures, so you experience minimal to no downtime during installation. You will also save energy on cooling costs, as we provide lighting solutions that greatly reduce the amount of heat released into your building from lighting. In most small to medium-sized businesses, lighting accounts for upwards of 25% of the annual power expenditure. Our professionals will show you more efficient options to reduce these costs by over 60%. When you consult with Custom Electrical Solutions on updating your fixtures, you will see how easy the process is. We offer fixtures that can be installed in just minutes using your existing wiring and housing, even without having to remove ceiling tiles. Whether you want a more modern or classic look, we will help you achieve your goals with expert planning, design, and installation. 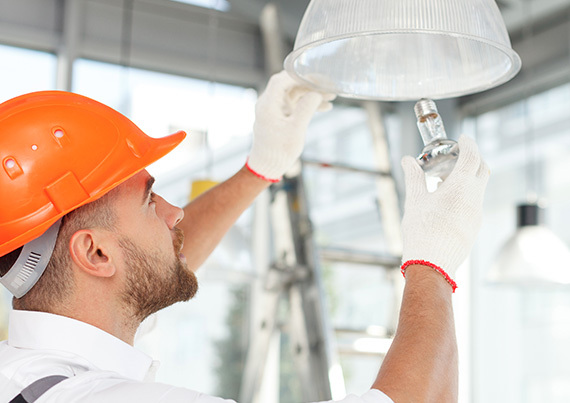 Update your lighting fixtures now by retrofitting with Custom Electrical Solutions!